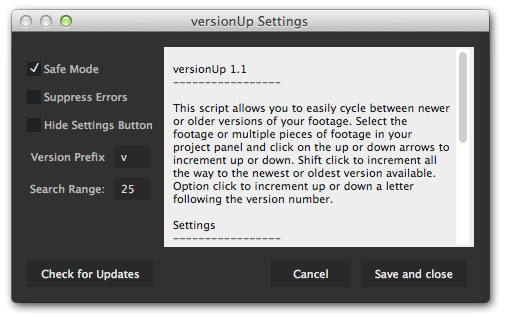 versionUp streamlines the tedious task of updating your footage to the newest version. It simplifies the switching of footage versions to a single click. Select one or more pieces of footage in the project panel, click the up arrow, and smartRender will update the footage to the next version available. Click the up arrow while holding the shift key and versionUp will skip to the newest version of the footage available. If you have ever been frustrated by the process of replacing footage by hand then versionUp is for you. If you are using v### (v1, v01, v001, etc) style version numbers in your footage and assets, versionUp will just work. It is smart enough to skip footage that doesn't exist and find the next available version. It can even version up or down comp and folder names. Keyboard shortcuts! The 1.1 release of versionUp now includes non UI scripts for each feature. These scripts can used to add versionUp buttons to ft-Toolbar or bound to custom keyboard shortcuts (see tutorial video). This release also allows you to increment letters following version numbers. For example, "v001a" can be versioned to "v001b". This action can be performed by holding down option (alt on PC) while clicking on the up or down arrows. Click the up and down arrows to cycle through versions of your footage. Shift + Click to skip straight to the newest or oldest versions available. Automatically skips versions if they don't exist. Works with stills, movies, and image sequences. It will even version up or down comp and folder names. Updates all version numbers in the file path, not just in the file name. Settings panel with options to customize the script to your liking. versionUp will fit seamlessly into any pipeline using v### (v1, v01, v001, etc) style version numbering. The version number padding can be any length as long as it is preceded by a consistent prefix. This prefix will usually be "v", but can be customized to any letter. To work properly, versionUp requires that the only difference between your files is the version number, be it in the file name or anywhere else in the path. If you are interested in versionUp but it will not work in your pipeline, send me a note and I am happy to discuss a custom solution. Custom keyboard shortcuts can now be assigned to run versionUp. Once the included non UI scripts have been installed, the AE shortcuts preference file can be modified to assign custom key bindings to the scripts. If you are an ft-Toolbar user, you can also create ft-Toolbar buttons to perform versionUp actions. See the included README file or this tutorial video for more information on assigning keyboard shortcuts and integrating with ft-Toolbar. versionUp features a dynamic UI that adjusts itself to fit anywhere you want to put it. Whether you have a highly customized workspace, or are still using the AE default, versionUp will feel right at home. You can even hide the settings button to reduce the visual clutter. Versioning to an image sequence with a different start frame will likely fail. Multiple unique version numbers in the same file name or path can produce unexpected results. Incrementing an AIFF file will change the "Type" from "AIFF" to "QuickTime". Shouldn't have any noticeable effect. Appears to be an AE bug. BUG FIX: Certain file types weren’t remembering their alpha interpretation after versioning.